The TARDIS brings the Doctor, Ace and Mel to a recently reopened shipyard in Merseyside. It's 1991, the hardest of times - but now they're shipbuilding once again, thanks to the yard's new owners, the Dark Alloy Corporation. A miracle of job creation - but is it too good to be true? While the Doctor and Ace go in search of an alien assassin at loose in the yard, Stuart Dale, discoverer of the near-magical Dark Alloy material, has an extraordinary proposition to make to his old college friend, Mel. But who is the Corporation's mysterious client? Who does she really represent? 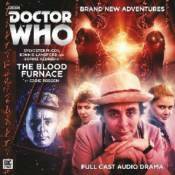 And what's the secret of the Blood Furnace? Seeking answers, the Doctor and friends are about to find themselves in very deep water Star Sylvester McCoy played the Doctor on television between 1987 and 1996, but is also recognised from such works as Peter Jackson's The Hobbit films. Cast: Sylvester McCoy (The Doctor), Sophie Aldred (Ace), Bonnie Langford (Mel Bush), Julie Graham (Carolyn).